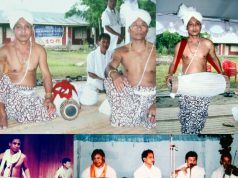 Thang-ta is a rare indigenous martial art which developed from the war environment of the tiny state of Manipur, which once became an independent kingdom since the early Christian era. Constant life and death struggles between clans, tribes and states resulted in the devising of ways and means of safeguarding the lives of the citizen soldierly and at the same time developing an inward attitude to problems of life, death and afterlife. Brave Manipuri forefathers could safeguard the sovereignty of the tiny hill state with the help of only Thang-Ta martial art by defeating the neighboring countries invading the state. The art form is dying now due to lack of patronage. Sixty five years old Puthem Mangi is a great exponent of Manipuri Thang-ta martial arts who have been dedicating his life relentlessly for the promotion and preservation of the art form since his early days. 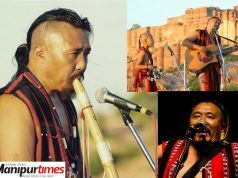 Born to late Puthem Ahanjao and Puthem Ongbi Thadoi of Keirao bitra Khunou in Imphal east, Mangi started learning thang ta and other acrobatic games at a very early age under the strict guidance of his father, a noted Thang ta, Acrobatic and Jatrawali artiste. Mangi is an expert Thang-ta artiste with indomitable and towering personality as he was properly trained by his late father under a strict training system during his childhood. 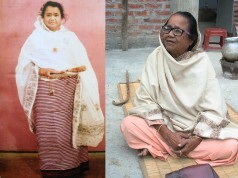 The grueling schedule was hard to cope with for young Mangi due to the extensive travelling, unabated Thang-Ta shows and training under strict regulations of his father Ahanjao. He used to hate his father for introducing him into martial arts oriented environment because of the strict regime that he was forced into. 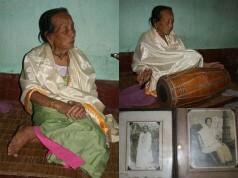 Young Mangi was deprived of friends and merrymaking during festivals like Thabal Chongba, Watching Shumang Leela plays. His father would wake his sons early in the chilly morning of winter for Thang-ta training. His youthful days were always Thang-Ta practice and then shows. “Despite all these facts, I could not speak a word against my father, because I was very afraid of him. As such, I had to endure everything to fulfill father’s dream to make his son a well equipped artiste in life”, recalled Mangi. Mangi said that his father was also a great Jatrawali artiste. Before he learnt Thang-ta, his father introduced him into Jatrawali when he was only 10 years old. For the first time, he acted the character of Govind in a play ‘Laibak Chaobi’ written by Maibam Ramcharan. 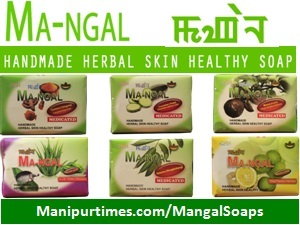 Mangi did not like acting in such stage plays and requested his father to teach him Thang-ta instead. 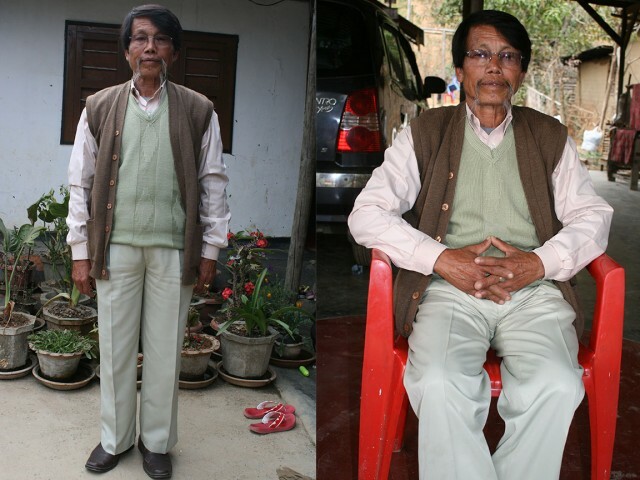 His father agreed to his son’s proposal and began teaching him Thang-ta. . Later, he formally started thang ta training under the guidance of late Padamashri G Gourakishore Sharma Principal of Hueyen Lallong Manipur Thang Ta Cultural Association since April 16, 1960. He joined Manipur Jagoi Marup in 1972 and started to showcase the Manipur Thang ta martial arts across the world by visiting many countries like USA, Japan, China, Germany, Thailand, France etc. In 1968, once father took me and my younger brother Joy to Arapti village for an Acrobatic show during Lai haraoba ceremony. When the show was about to complete, my brother fell from a high poll as rope broke accidentally. Luckily, he was unhurt in the incident. My father who directed the performance tactfully saved the situation saying jumping down from the poll at the end of the show is part of the game”, Mangi recalled. 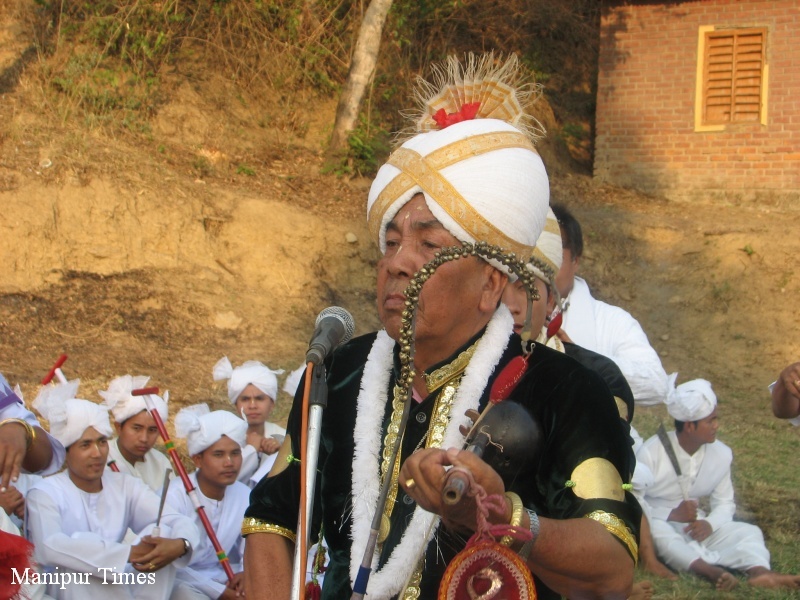 Mangi is an expert of Thabi Kakpi (Cucumber cutting with blind folded eyes), an enthralling item of Thang ta. 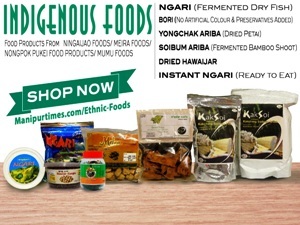 He learnt the art from one late Sagolshem Tomba of Keirao bitra. 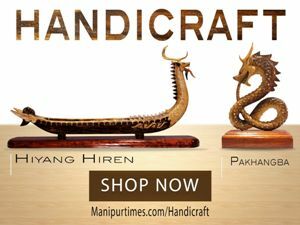 Thoubal Nimai, Kyamgei Manglem, Wabgai Amumacha and Sagolshem Tomba of Keirao are still regarded as experts who coined this particular enthralling item of Manipuri martial art. Mangi fully inherited the skill of Acrobatics from his father. In fact acrobatic thang ta was a family legacy of Puthem family. “I and my younger brother, Joy were trained acrobatic thang ta by our father strictly. During rehearsal practice, father used to thrash us with a stick when we failed to properly perform the art in the way he liked. Father liked his sons to carry forward the family legacy of Thang ta”, he maintained. 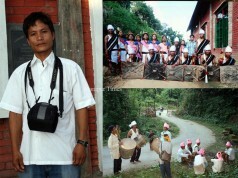 Keirao Machin Manao Thang ta is a popular Thang-Ta troupe in the state and outside. The troupe comprised Puthem Mangi and his late younger brother Puthem Joy. The two brothers’ Thang ta performance in Thang Ani Yanaba (Duel Fight), Ta-Thang Yannaba (Spear and Sword fight), Yotpak Thangjou Yannaba (Spade-Dagger fight) could enthrall the audience of the world because of the cleverly choreographed Thang-Ta acts, skillfully mixed with acrobatic moves based on gymnastics and traditional dances. It is said that the daredevilry of the Machin Manao Thang-Ta shows such as the spade duel. The blindfolded Machete duels and the rope fight acts gave audiences Goosebumps because of the intensity of the actions. One such show in the USA, the organizer discontinued a show because some audience found the fight disturbing. However, people have now missed the enthralling Thang-ta performance of the two brothers after the death of Mangi’s younger brother Puthem Joy in 1992 due to an illness. Mangi’s sister Puthem Thaba is also a prominent Thang-ta artiste who runs a Thang-ta institute of her own. 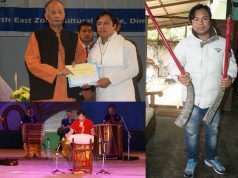 In recognition of his unique skills in Thang-Ta and other Manipuri cultural art forms, Mangi was recently honoured with the prestigious Manipur State Kala Akademy Award 2015. Other NGOs have also honoured him with awards. He said that our brave forefathers protected the state from enemy invasion by dint of Thang-ta. 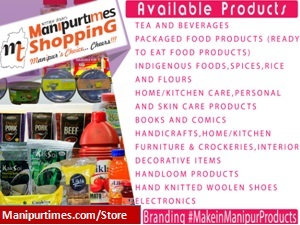 As such, it was a customary for every Manipuri household to keep a Thang (Sword), Ta (spear) and every man in the family was a volunteer Army of Manipur King. In old days, learning to become a Thang-ta warrior had to undergo certain disciplines in his entire routine of daily life, whereby his engagement of mind and body are attuned to a realm of preparation, relaxation and focus where a spirit of calmness, concentration and devotion become a feature of his life. 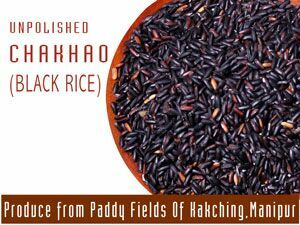 The old traditional values emphasized in Yaahip, Chakcha, Phampham (literally Sleeping, Eating, Sitting) which are basic value based discipline systems of organizing the body and mind in order to reach perfection in totality of his life are most vigorously followed by the artist. The value emphasized in culture are thus to respect the elders in the family and in the community, to develop a spirit of sacrifice and love for the country, with the ability to give away one’s life without rancor, not to hurt the enemy when he is running away or when he is naked, not to do whatever is against the moral order of the day. 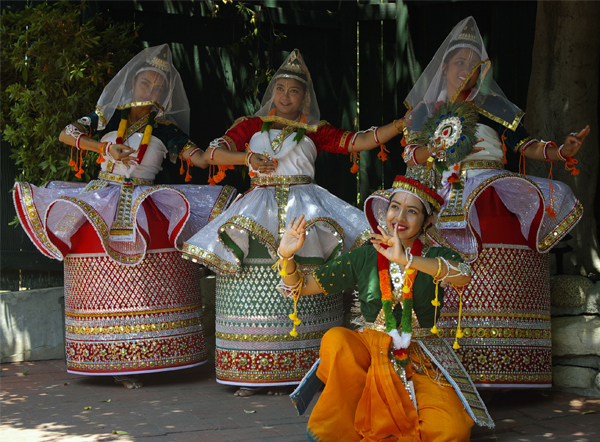 Mangi has been instrumental in showcasing and popularizing the Manipuri Thang-ta martial art by deploying different Thang ta Artistes troupes at Bangalore, Delhi Goa, Hyderabad and Gujarat etc. under his own Martial Arts Training Institute. Although Thang-ta is a popular art, future is bleak for Thang ta artistes as they are unable to make a comfortable living with the income from thang ta art career while other Artistes of Shumang Leela, Pung, Music etc are earning better income. People used to invite artistes of Shumang Leela, Pung or Music for performance with huge fees while there hardly any man who is ready to invite thang ta Artistes for shows. Thang-ta artistes opting for this art form has no future since there is no government policy. As such, we are sometimes compelled to commercialize the art form through shows in outside states for maintaining our poor families, he said. Next article20 Congress MLAs are right while Home Minister is wrong. Why?